SUBSTREAM is a third-person shmup that's choreographed to music. Substream is an abstract aerial shooter where you battle the waves of attacking enemies. But it's not that simple, because space is wrapped. 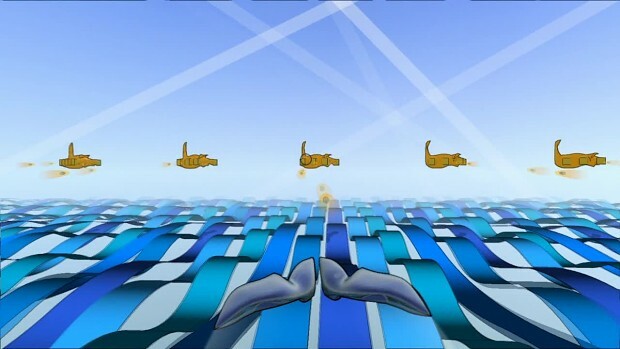 Enemies appear in multiple positions ahead of you, and your lone fighter ship is a squadron stretching off to infinity. Expect to be flanked by enemies that are right in front of you. Every level in the game has been animated with a different musical genre and the entire environment is dynamic. Terrain and scenery morphs and pulses with the rhythms, melodies and themes of the soundtrack. Substream is being developed for Windows PC. Report RSS	Substream Alpha Gameplay - "Messi's Breakdown"
A gameplay clip from an alpha version of "Substream", an aerial shooter choreographed to music. This is the intro to a level based around "Messi's Breakdown" by the Monster Ceilidh Band, from their Album "Mechanical Monster". Substream is currently in development for Windows PC, with other platforms to follow.